It must have been a slow news day if falling out a bed and receiving a skinned finger makes the big news! 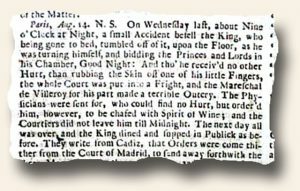 Hmmm, maybe the King had some of the “Spirit of Wine” prior to his going to bed as well? Food for thought!